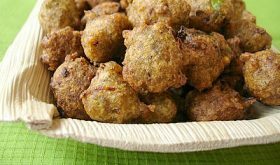 Both Satish and I like to snack on some tasty nibbles with our evening tea and one tea-time snack I prepare once in a while, are green moong dal fritters – full of earthy goodness, simple with few ingredients, flavorful and ones which Nehal also relishes. It hardly takes any effort to prepare them – to savor these fritters at tea time, remember to soak the moong dal atleast 5-6 hours before tea-time. Best eaten hot, off the skillet, when the crust is crisp. When eaten cold, its sort of chewy but pleasantly livens up our palate with a hot cuppa chai. Grind the soaked and drained moong dal, green chillis, ginger and salt to a paste. There is no need to add water while grinding. Remove onto a dish and add the chopped onions, coriander leaves, cumin seeds and mix well. Heat oil in a deep frying vessel. Once its piping hot, reduce flame to medium and drop a little mixture (about a tbsp) and fry the fritters to a golden brown color. Deep fry a batch of 8-10 punukulu depending on the size of the vessel. Serve hot over a cup of masala chai. Looks yummy.If you sprinkle some yoghurt and chaat masala with onions and cilantro,it tastes divine like srteet cart chaat! 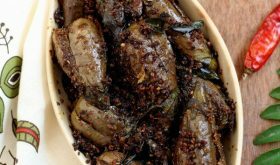 very delicious and healthy recipe sailu! getting to see another of your yummmy snack! looks like you’ve made quite a lot of these, may be I should join you guys :). This is how called being a little health concious even when you make finger food. Loved the fritters. I have had something like this in one of the restaurants recently and even loved it. Thanx for sharing it. Those are delicious fritters you have there. Visit to your blog is always refreshing and tasty. Looks good Sailaja, We make fritters like this with Red Masoor. PS. Apologies for cross posting. This is not spam. We have a plan to unite all Hyderabadiz: Calling out to all Hyderabadi bloggers. We are trying our best to gather as much as possbile (I mean the sound and the fury, show and tell, look and feel of our true colors). Push, pull or try your best to bring more people join the event of uniting Hyderabadi Bloggers. These fritters look very good Sailaja. I too loved all the snacks till I came to US. here with any deep fried food, I get throat pain, so have almost stopped. But I miss them a lot. Your pictures are beautiful as usual! Love this version of a ‘vadai’. Will certainly try it! Just like Sandeepa, even we make these snacks with masur dal. Something to do with eastern India perhaps!! I think I have tasted something similar like this before… Lovely! Very nice recipe – i do make pesarattu off and on. This one is a good idea for guests to make a big bunch of munchies. I did try your tomato dosa – turned out nice! One of my fav snacks. Presentation is good as always. Is this a whole moong or moong dal?? Need a suggestion not related to cooking-one of my neighbor here in US is from Andhra. Would like to gift something from Chennai. What would you suggest me in this regard?? Pesara punukulu looks very good.Its ages since I ate them.I cut on all fried foods .But I think once a while we can indulge in this luxury. Please keep on posting . All of us are waiting for more…. Hi Sailu,i am preparing this for tea time today. I’m just assuming that the garlic will be added with the grinding items, you didn’t mention abt garlic……thank you for the healthy recepie. Garlic is an optional ingredient. You can avoid it if you are fond of garlic. If you want to use garlic, you can crush and add or add it with along with the other ingredients for grinding.